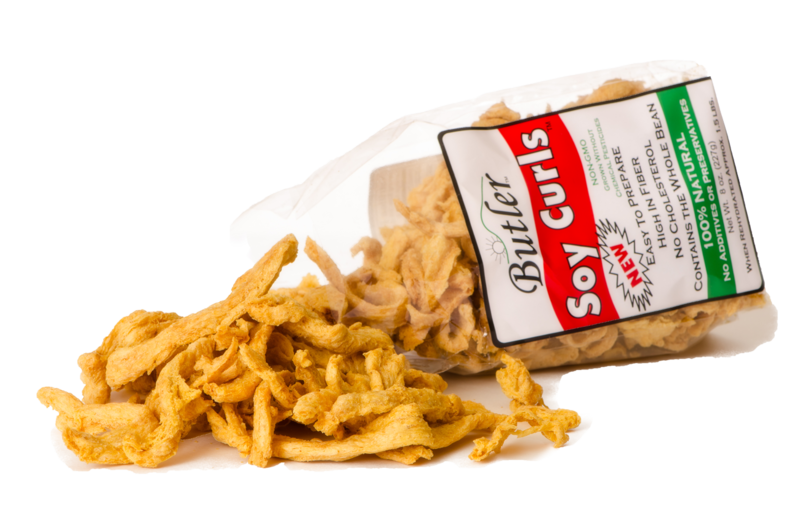 Soy curls are dehydrated strips of soy protein made out of whole, non-GMO soybeans that are slowly cooked until they're soft, then processed by a machine that breaks them into strands. Then they're slowly dried at a low temperature and packaged. That's it. No added fat or flour -- just soybeans that have been transformed, leaving them high in fiber and omega-3 fatty acids, with 10 grams of protein in every serving. You can order them on Amazon or directly from Butler Foods. Soy curls are delicious and can be used in so many different recipes. I order the 10 lb box and keep them in the freezer. Today I bring you a whole meal of recipes. I used my air fryer to cook up the soy curls, coated in bbq sauce and put on a corn tortilla. Topped with an avocado coleslaw with a side of tomato-garlic salad. Yum! Soak soy curls in warm water. Just enough water to cover them. Soak for 10 minutes. Strain and squeeze out excess water. Season with the nutritional yeast and sea salt. Put into air fryer- 400 degrees for 10 minutes. Shake half way through. They should be a little on the edges. Coat with the bbq sauce. Heat your tortillas in a dry skillet. Mix the mashed avocado with lemon juice, water and sea salt (you could also just blend it). This is the dressing for the coleslaw. Start with the lesser amount of cabbage. If there is too much dressing add more cabbage. This makes a great topping for the tacos. Mix all together and let sit for about 5 minutes to merry the flavors. You could use a bun for the bbq soy curls and coleslaw instead of corn tortillas- a sandwich instead of tacos. Next Article Spring Reset! Get Your Routine On!